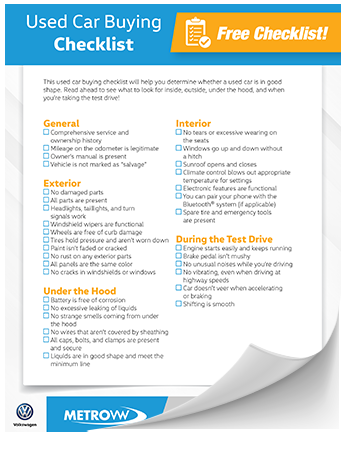 You Are Here: Home > Download Our FREE Used Car Buying Checklist Today! Download Our FREE Used Car Buying Checklist Today! Making your next car a used car is a great choice for shoppers in Irving, Grand Prairie, Grapevine, and Dallas. However, there are a number of things that you’ll want to check up on when considering a used vehicle. 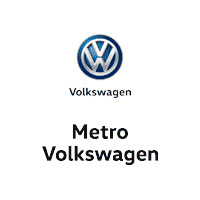 To help you find a quality used vehicle, we at Metro Volkswagen have put together this FREE Used Car Buying Checklist. This extensive checklist is all-encompassing and helps you make sure that you’re getting exactly what you want. This checklist includes all the things you need to look at inside and outside of a used vehicle before you buy it. It also tells you what to look at under the hood. Lastly, it lists all the paperwork and documentation you need to see before you sign for your used vehicle. Don’t buy your next used car without looking over our helpful and free Used Car Buying Checklist. Download yours today by filling out the simple information request form on this page. Once you’ve clicked submit, you’ll have instant access!